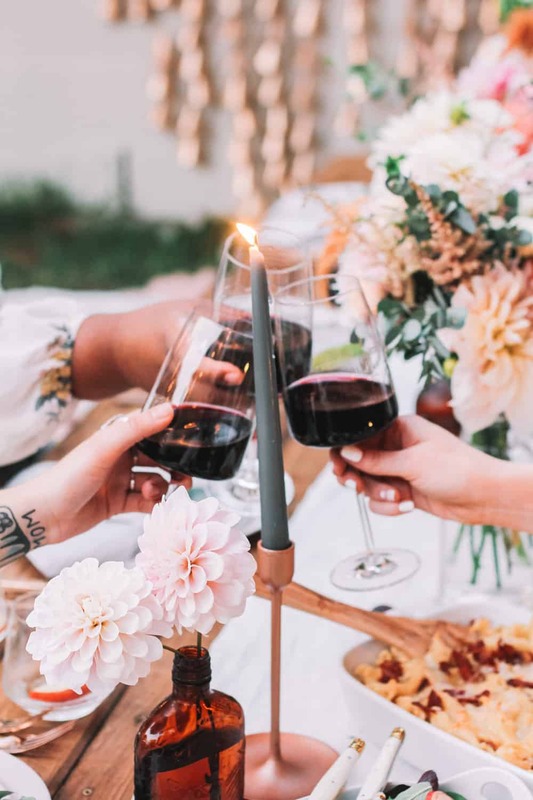 Friendsgivings are for bringing over your closest tribe for endless wine, funky music and plenty of fall inspired recipes! 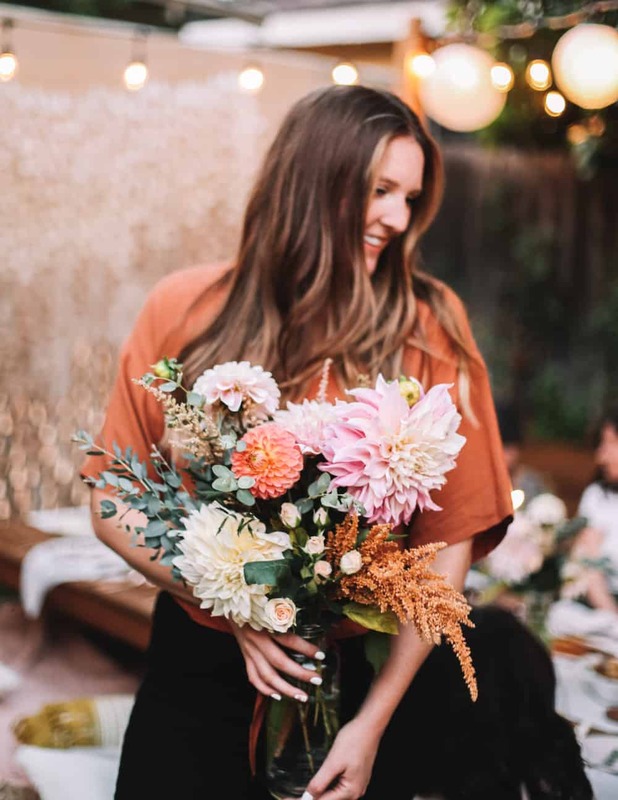 Feel free to swap out traditional décor with your favorite color palette for a personal twist. Whatever you do, don’t worry about everything being perfect. 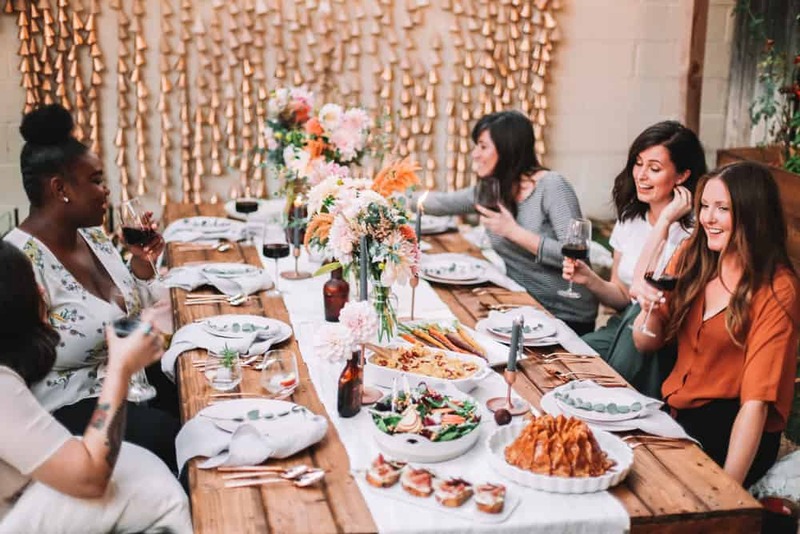 Making sure everyone has a full wine glass, saying what were thankful for and creating new traditions are my top priorities for friendsgiving. I love the ease that is friendsgiving. No pestering relatives asking when you’re getting married, if you’ve gained weight or what you ‘really’ do for work?! Please tell me that I’m no the only one who gets a decent question round around the holidays?! Friendsgiving is the opposite. 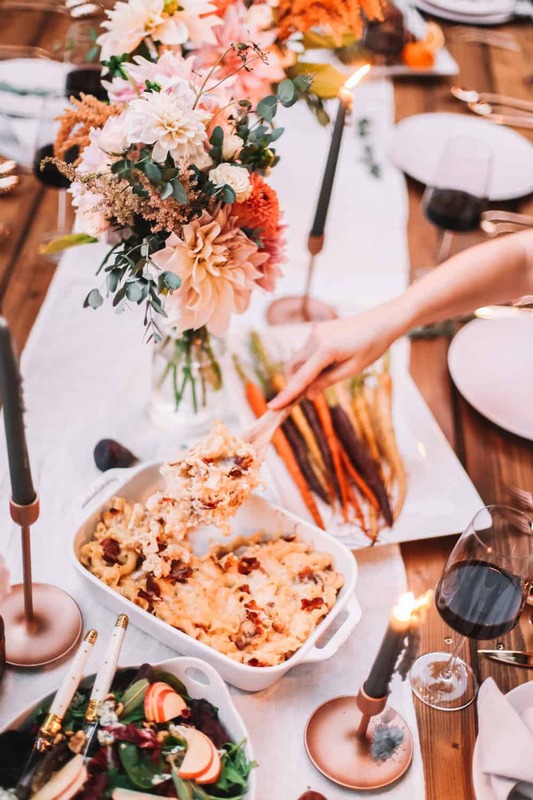 It’s one of those holidays that is perfect for giving entertaining a go in your home! Everyone loves a holiday centered around food so it’s hard to really mess it up, ya know?! 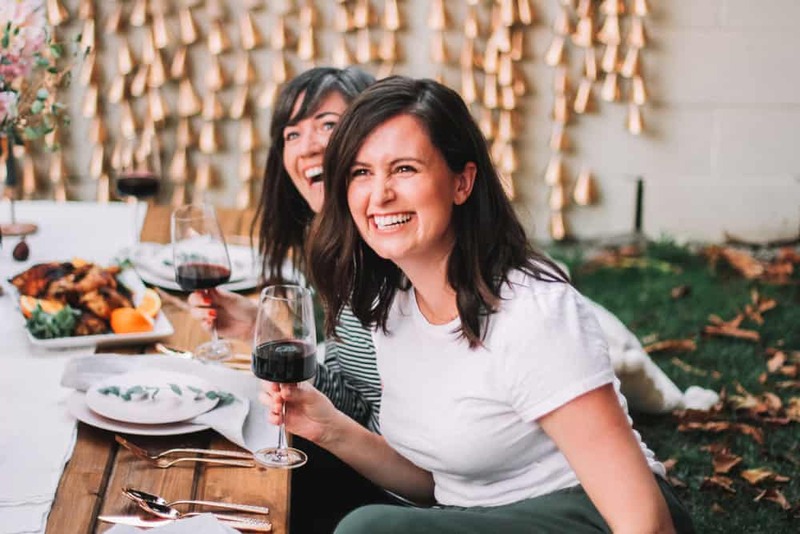 This year I have teamed up with The Inspired Home to cover an epic Friendsgiving in their second edition of The Inspired Home Journal! You can grab a copy in Barnes and Noble and Whole Foods to see this gorgeous story in print! Having content printed in a magazine was a total pinch me moment! These are things that I only dreamt about when I was a teenager and the fact that they are coming true doesn’t even seem real! Grab your copy of the magazine here! And be sure to check back as we will be releasing all of the recipes from this friendsgiving menu through out the week! 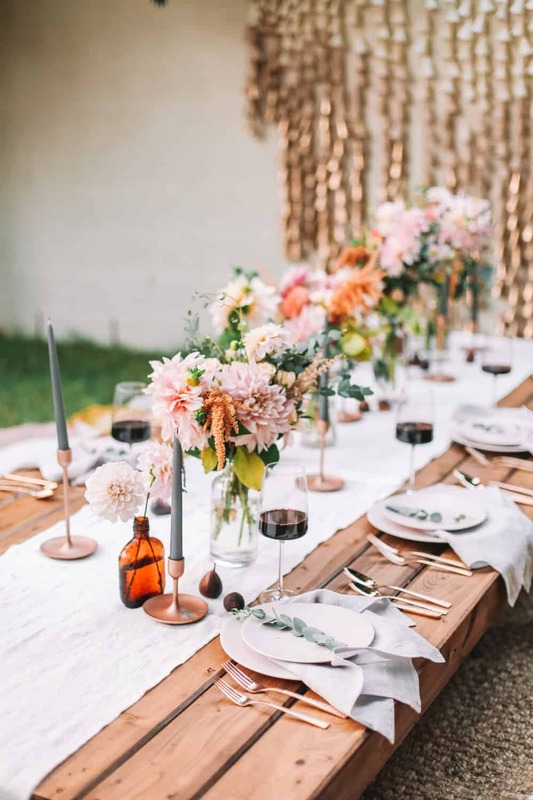 Be sure to check out all of the tablescape details we used over on The Inspired Home! 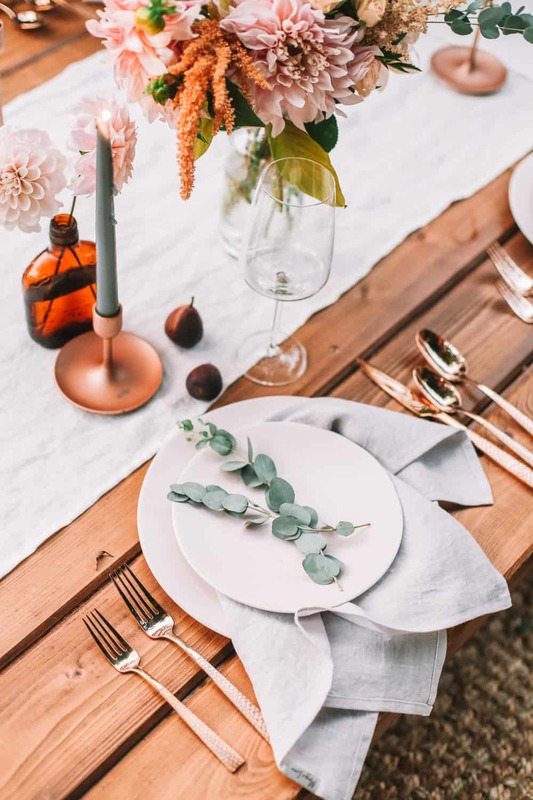 Find the plates, flatware, glassware, serving dishes and more to recreate this fall blush look for your own friendsgiving! 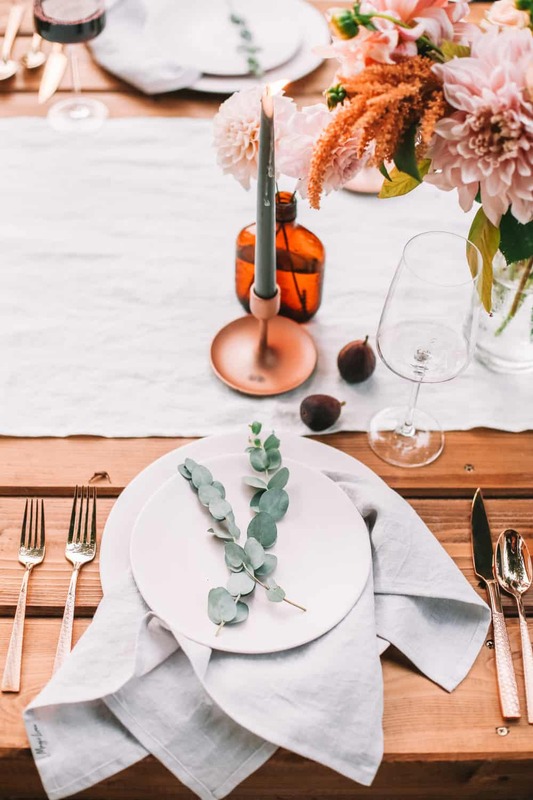 Menu Inspiration? Keep it simple! Stick with a seasonal inspired cocktail for the evening. Having an easy self serve cocktail will keep you from playing bartender all evening! I love having a light, flavorful bite at the beginning of the evening. This will buy you sometime in case dinner is running late! When it comes to side dishes I love having a starch based side dish and a vegetable side dish. Thing Macaroni and cheese and roasted brussel sprouts or potatoes au gratin and garlic green beans. It’s all about balance! When it comes to the main event I love doing slow roasted, flavorful meat like turkey or a roast. If you have a vegetarian crowd, lasagna and risotto are great hearty alternatives! Focusing on one great dessert instead of 3-4 will leave you with a gorgeous centerpiece to your table. Feel free to dress up something store bought it desert isn’t your thing! This friendsgiving menu is hands down one of my favorite’s that I have EVER put together! The flavors are well balanced but so interesting! 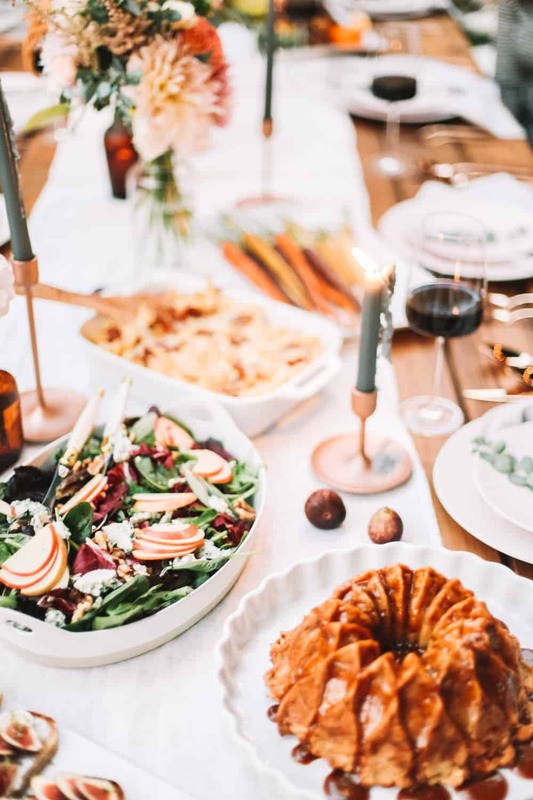 You can make any of these dishes for friendsgiving or Thanksgiving, you decide! Promise you’ll check back every day for each recipe and be sure to screen shot them for the big day! A light and seasonal cocktail to kick start the party! 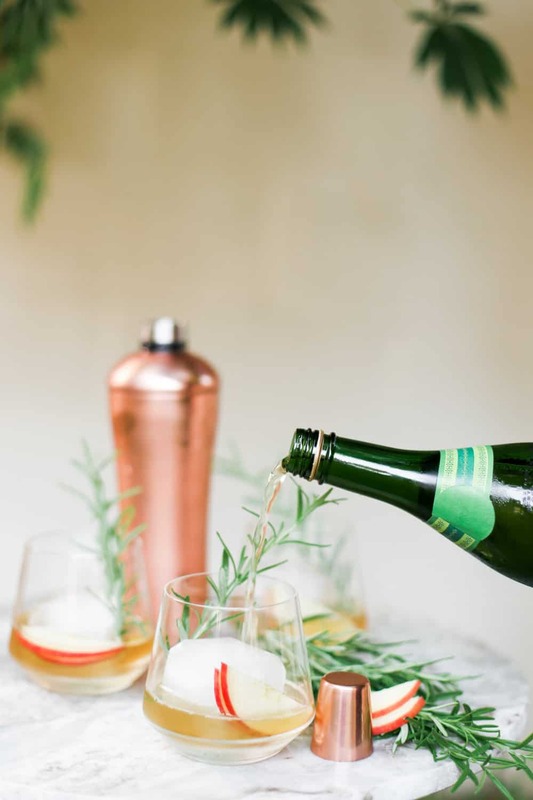 This apple cider whiskey rose is made with a homemade rosemary simple syrup, bourbon and topped off with sparkling apple cider or hard apple cider! Crisp, bubbly and anything but basic. 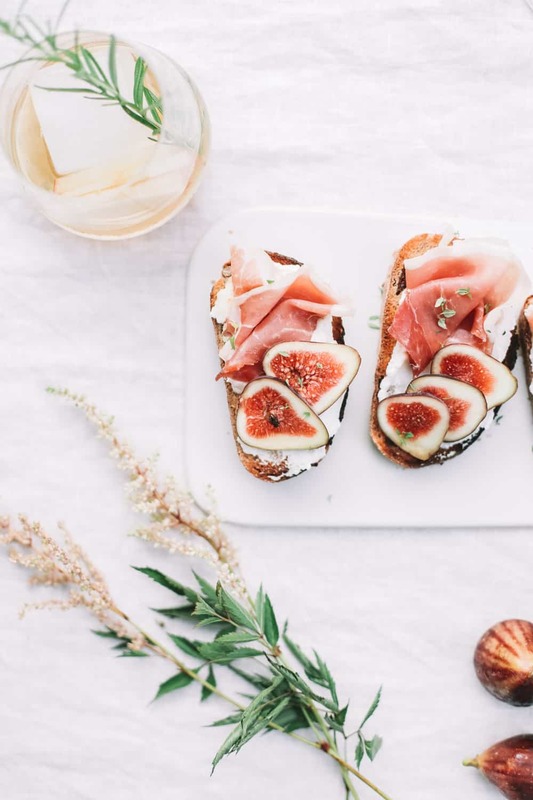 This crostini is as tasty as it is beautiful. 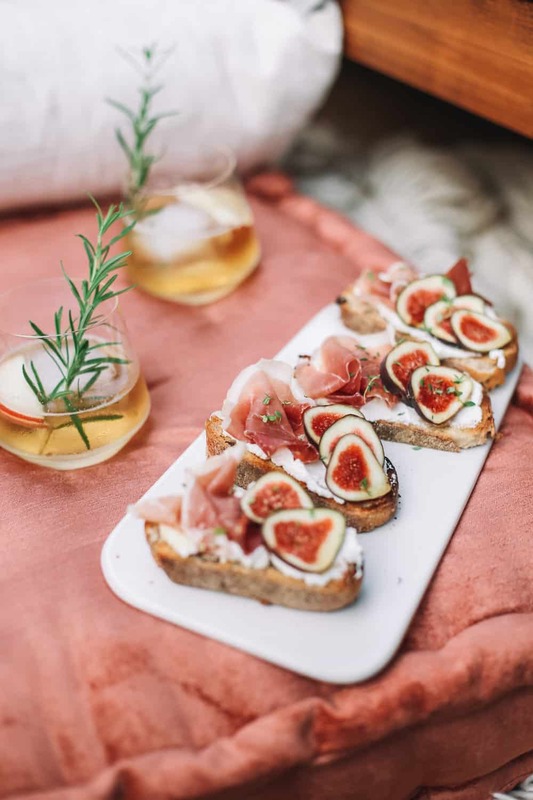 I love mixing sweet and salty combos and the prosciutto and fig slices do just that. 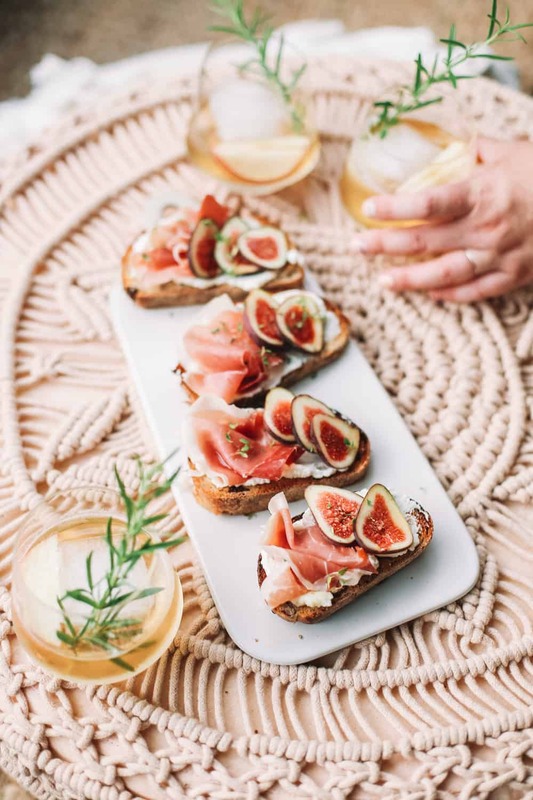 If figs aren’t in season or not your favorite, you can swap with pear or apple slices! Basically the fall mother load of all mac and cheeses! 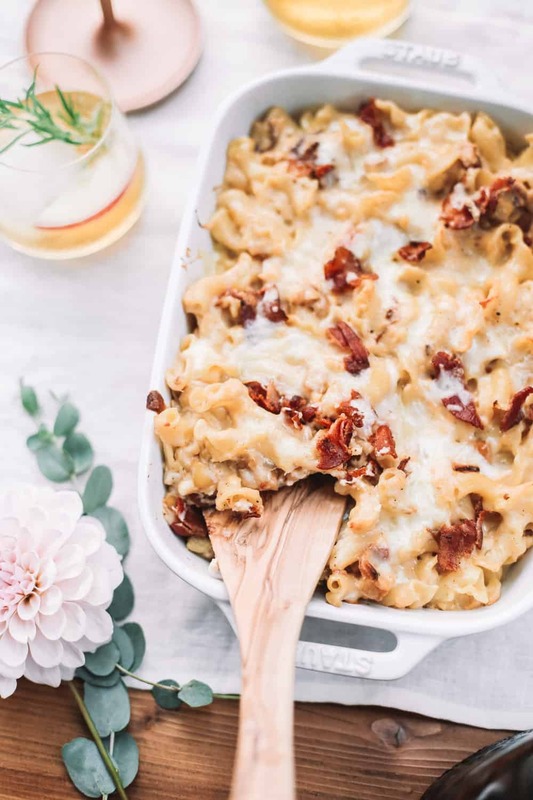 This salty, smoky dream is made up of caramelized apples, crispy bacon, and smoked gouda. 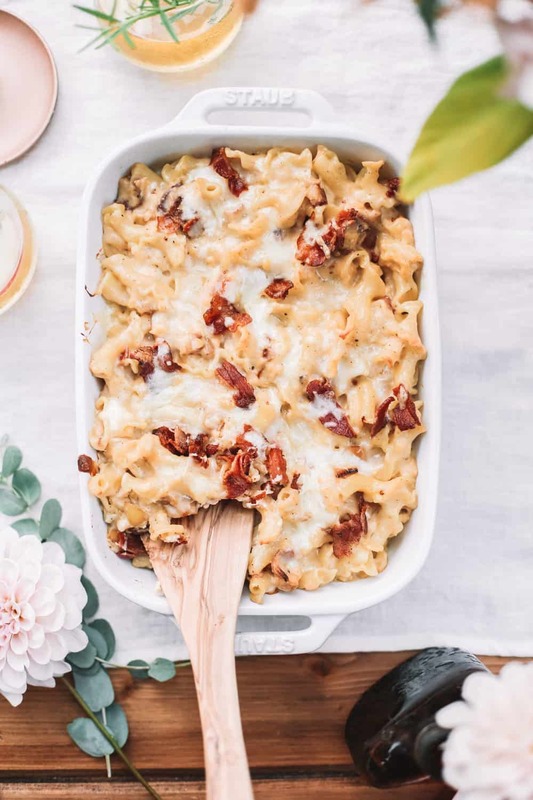 If you have one cheesy side dish on your Thanksgiving table this year, I hope it’s this recipe! 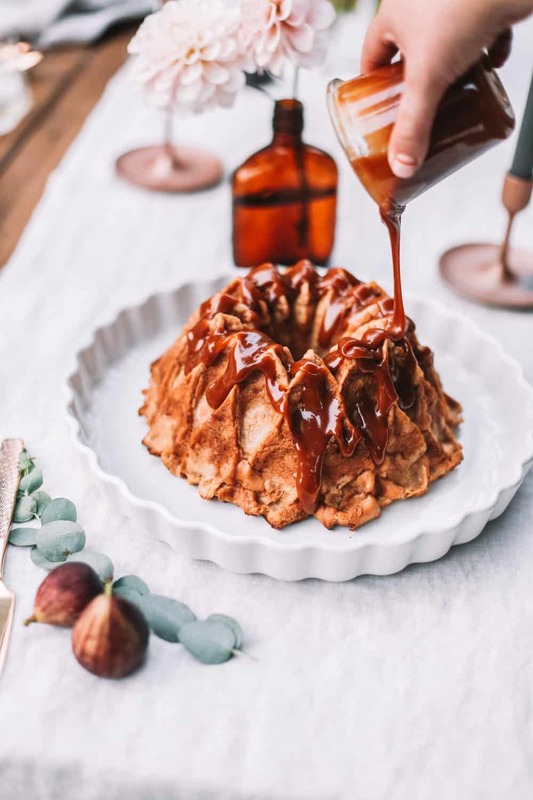 Hands down my favorite part of this year’s friendsgiving menu is this apple chai bread pudding bundt cake! It was dynamic, flavorful and so interesting! 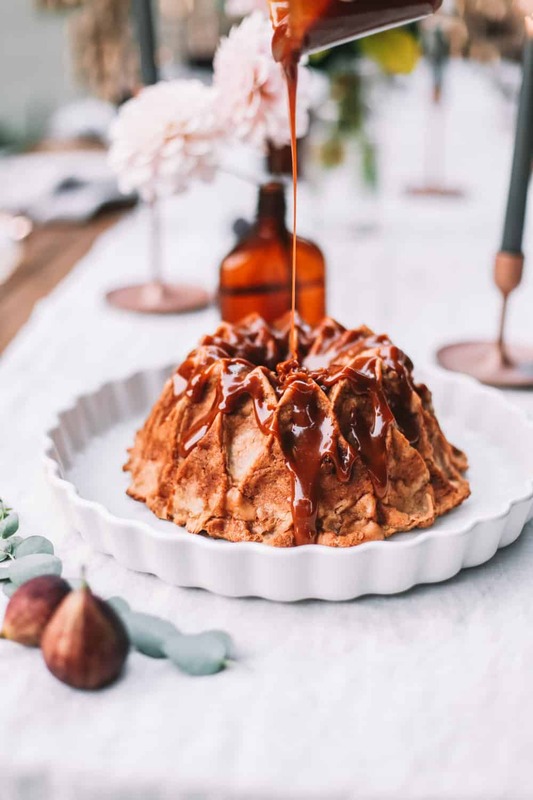 It’s a bread pudding batter that has been pressed into a bundt cake and drizzled off with vanilla bean caramel. Promise me if you make one thing from this menu, it’s this cake!